MONDAY, 4 APRIL – Lectures at Universiti Malaysia Sabah (UMS) will be suspended if the level of the Air Pollution Index (API) kept increasing, said the Vice-Chancellor, Professor Datuk Dr. Mohd Harun Abdullah. He said, the university will take this drastic step if the air quality continues to deteriorate, to ensure the safety and health of its campus community, especially amongst students. 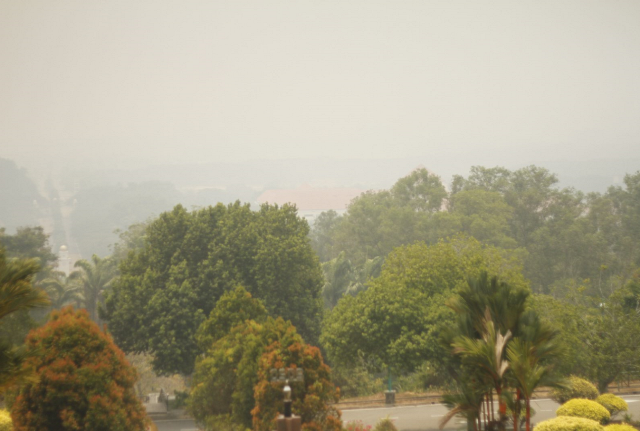 “The university takes the current haze situation seriously and will continue monitoring from time to time while, keeping abreast with the latest API level issued by the Department of Environment,” he said in a statement today. Datuk Harun said that as an initial step, UMS would distribute free masks to students. According to him, the mask could be obtained through all residential colleges and the Student Affairs Department in an effort to help students filter out from inhaling the contaminated air molecules that could be harmful to their health. Datuk Harun also advised all campus community to reduce any outdoor activity until the level of air quality improved. “At the same time, I would like to remind all staff and students to always drink lots of water,” he added. Until 1.30 this afternoon, the Department of Environment recorded an API reading of 68 in Kota Kinabalu. API between 0 to 50 is considered good, 51 to 100 (moderate), 101 to 200 (unhealthy), 201 to 300 (very unhealthy) and 301 and above (hazardous). On Sunday, the State Education Department announced the closure of 77 schools in and around Beaufort, Kuala Penyu and Papar due to the worsening haze.